The garden changed quite a bit while I was gone, and not all of it for the better. Yikes, it’s been hot! Our big, 100 gallon smart pot is a little slower than other things in the garden, I think largely because it is in a slightly shadier spot. However, the cucumber has finally taken off! It grew up the side of the tomato cage and is now working its way up the chain that was hanging above it. Crazy cucumber! The peppers aren’t looking quite as nice as I might wish. They are a little bit pale in color, which is probably a nitrogen deficiency. They aren’t really producing either, which is probably partly due to the lack of nutrients. I gave them some fertilizer, so they should be looking better by next week. The smart pot isn’t drying out much differently than any of our other containers, but it maybe isn’t a very good test since it is in a slightly shaded spot. 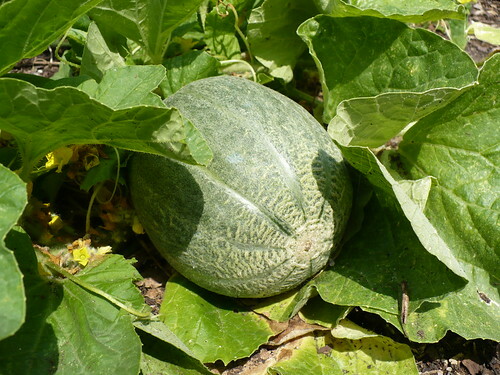 This is the ‘Honey Bun’ cantaloupe that was such a cute baby just a week ago. You can see the netting starting to develop on the end, but it is still very green! 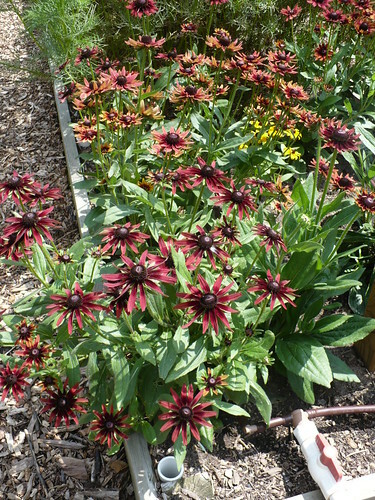 The ‘Cherry Brandy’ Rudbeckia in one of the cutting flower gardens has burst into bloom. It is almost too pretty to cut! Surprise! 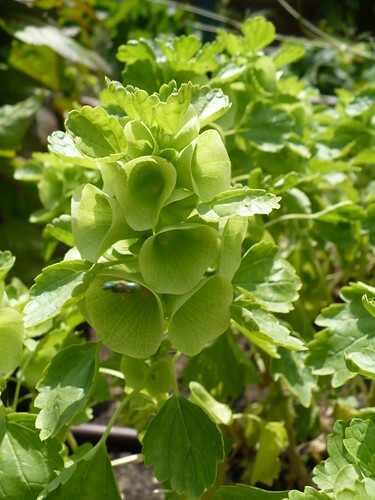 The Bells of Ireland are blooming! Actually, it’s quite impressive that they are blooming, given that they much prefer cooler spring weather. I was fully expecting them to either croak or hang out and wait until the weather was cooler before blooming. There is no getting around the fact that these are just weird flowers, though. The top cucumber is one of the ‘Diva’ Cucumbers from the Family of 4 Garden. The other two are from the Asian Garden. The ‘Diva’ is actually about 6+” long, which helps you appreciate how huge the other cucumbers are! 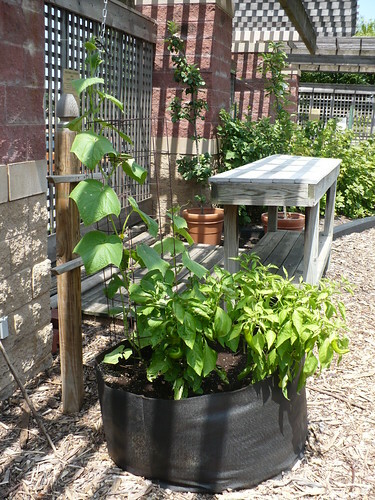 Posted on July 16, 2010, in Family of 4 Garden, PhotoEssays and tagged containers, flowers, harvest, melon, peppers. Bookmark the permalink. Leave a comment.